Wrestler-turned-'Today' show host John Cena took on a 757 jet Friday alongside 19 Delta employees at the seventh annual Jet Drag to raise money for the American Cancer Society. The epic battle of tug-of-war aired on the 'Today' show this morning. Innovation drives Delta people to think differently about any challenge and cancer is no exception. 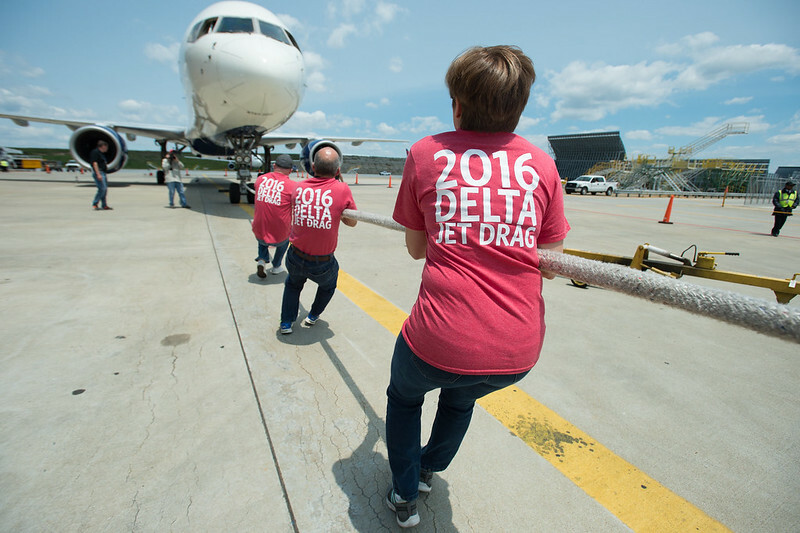 Seven years ago, Delta employees decided to fight back against the disease in true Delta style, pitting teams of 20 against a 757 in the ultimate tug-of-war showdown. From there, the Delta Jet Drag was born, a unique event to raise funds for the American Cancer Society. This year, 94 teams tried their hand at moving the jet 20 feet in the fastest time. Team Finish the Fight, made up of 19 cancer survivors and caregivers, brought in a ringer to help. WWE superstar and ‘Today’ show guest host, John Cena visited Delta TechOps to lend a little extra muscle and pull for a purpose. Cena took the time to speak with caregivers and survivors to hear their stories and learn how cancer had touched their lives. Although his team fell short of first place, they did move the plane in just over 11 seconds. Thanks to the Jet Drag and other Delta events, Delta employees have raised over $1 million to support the American Cancer Society this year.